Navicular Horse Disease - Is it over diagnosed in equines? Characterized by gradually increasing intermittent lameness often of both front feet, navicular disease is one diagnosis no horse owner wants to hear. This disease is often associated with hard work, and is incurable. Affected horses will shorten their stride, most noticeably when going downhill, and can be reluctant to turn. Sometimes the lameness can seem to 'switch' from one side to the other. This is due to the disease affecting both front feet to different degrees. However, some veterinarians feel that navicular disease (or as it is sometimes called, navicular syndrome) is overdiagnosed. Knowing more can help you decide what to do if your horse is diagnosed with navicular disease. First of all, what is navicular disease? This disorder is caused by a gradual deterioration of the navicular bone at the back of the horse's foot, near the heel. Some veterinarians will diagnose navicular syndrome, using the term to broadly include all the soft tissue surrounding the navicular bone. Veterinarians aren't sure exactly what causes the bone to deteriorate, but most feel that navicular disease is a degenerative condition like arthritis. Frequently, navicular disease strikes horses that perform hard work, often on hard surfaces. Once thought to be an extremely common condition, many veterinarians now think that it is less common than was once believed. Foot problems are the leading cause of lameness. However, before accepting a diagnosis of navicular disease, there are other factors that the veterinarian should consider. While there are certain people who believe the shape of the hoof can indicate that a horse is at greater risk for navicular disease--such as horses with upright, small hooves, or horses with large, platter-like hooves--there is not much evidence that hoof shape is a very important risk factor. However, some risk factors are proven, such as performance horses that spend more time running hard, and in whom the condition is most bothersome. 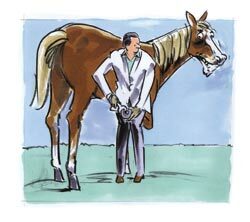 Also, age is a factor, with navicular disease most often striking horses between seven and eleven years of age. The signs of true navicular disease can be identical with those of sore heels, which can complicate the diagnostic process. "Pointing," which refers to a horse standing with its front feet far in front of its body, is a common symptom of both navicular disease and sore or bruised heels. Also, riders may notice the horse is reluctant to turn, another shared symptom. Many diseases can mimic navicular disease besides sore or bruised heels. Chronic heel collapse is another, as is a torn deep flexor tendon at the point where it inserts into the coffin bone. Simple stress and strain from overwork can result in a horse showing the symptoms of navicular disease. The soft tissues around the navicular bone can also be strained, such as the impar ligament or the suspensory ligaments surrounding the bone. The coffin joint can also become inflamed. The list is long and this is not a complete list of things which share the symptoms of navicular disease, which is why it is important that the veterinarian not jump to this diagnosis without more tests. No one test can definitively diagnose true navicular disease. A diagnosis is made by performing a series of tests--hoof tests, nerve blocks, x-rays, stress tests, bone scans--and reviewing all the results to find the most likely cause of the horse's lameness. Studies are progressing regarding the use of ultrasound or MRI to help veterinarians to determine what is going on inside the foot. Many veterinarians will not diagnose navicular disease until the horse has failed to respond to any treatment for at least ninety days. Keeping all this in mind might help if your veterinarian diagnoses navicular disease after only a cursory examination. In the case of true navicular disease, caused by the deterioration of the horse's navicular bone, there is no cure. However, horses affected by navicular disease can be made more comfortable in a variety of ways. New shoeing and trimming techniques can relieve stress on the bone, and pain-relieving and anti-inflammatory medications can also help. In horses that are more severely affected, the only effective treatment may be to remove the nerves to the area via a surgical neurectomy. While this does give relief from the heel pain, it is only a temporary solution. Surgical neurectomies can produce occasional side effects. Most commonly (but still only rarely seen) are neuromas. These painful lumps are caused when the ends of the severed nerves grow back together in a large ball, forming a lump which can be felt under the skin. Very rarely, a horse may experience a complication which could necessitate the amputation of the foot, but this is extremely uncommon. More commonly, horses will have bad results if they receive a neurectomy when they do not have true navicular disease. For example, if the horse's lameness is due to a deep flexor tendon problem rather than the navicular bone, the horse can severely damage that tendon because it will be unable to feel the pain from the injury. If your veterinarian diagnoses navicular disease, it is therefore prudent to seek a second opinion. Presenting a second veterinarian with the films from the bone scan and x-rays can allow him to give an opinion without putting your horse--and your wallet!--through another round of tests. Taking the time to do this can prevent a costly and painful misdiagnosis. Read the next horse health tips article on Stomach Problems & Ulcers.